It’s kind of funny, my relationship with fajitas. At least I find it amusing enough to share :). I never ate fajitas until very recently, and only at one restaurant near our house. 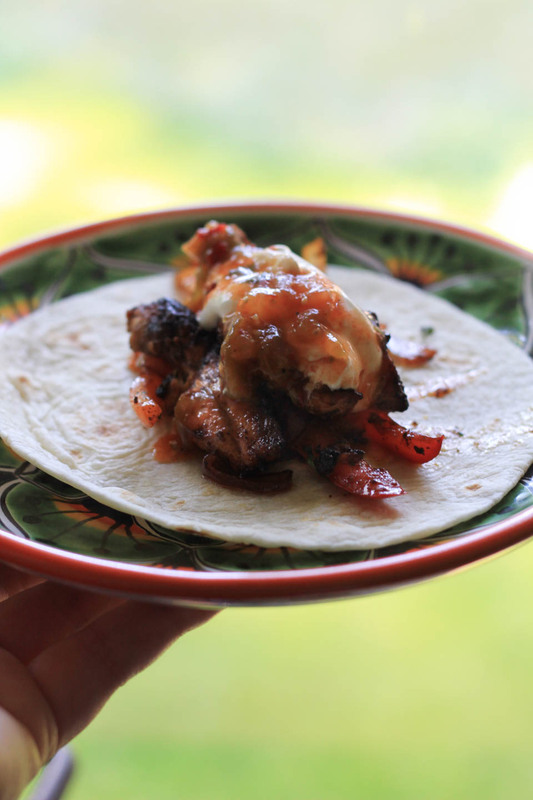 Fajitas are not Mexican food the way I grew up eating, they are real Tex-Mex invented in Texas, and I just never really ate Tex-Mex growing up. I grew up in California with Cali-Mex and tons of fajitas around, but they were normally present on chain restaurant menus, and I never ate at those restaurants. I ate at the real Mexican food places, the hole in the wall where they knew my name, fed me tacos and made my heart smile. We just didn’t eat at those other places, they weren’t Mexican food to us, the way we eat in Mexico that is. So fajitas was never something I was around or ate. Until last year when we moved to the opposite side of town on Brian’s birthday. We stopped and ate at a Mexican restaurant near by, literally 5 minutes from our house, and it was good! I had a chile relleno and lengua (beef tongue) taco. That is something I normally order to see whether it is as near authentic as I can get in Vancouver, Wa. If they can cook tongue, we’re all good here. They could, so we went back. Brian likes fajitas, so he ordered them, and serioulsy. So good. It was a deep savory, garlic, lime, cilantro heaven taste. Now, I don’t order them when I am craving Mexican food, but I do order them way more often than I expected. Which of course prompted me to make them at home :). I needed to make them at home to see how they get that savory amazing flavor. 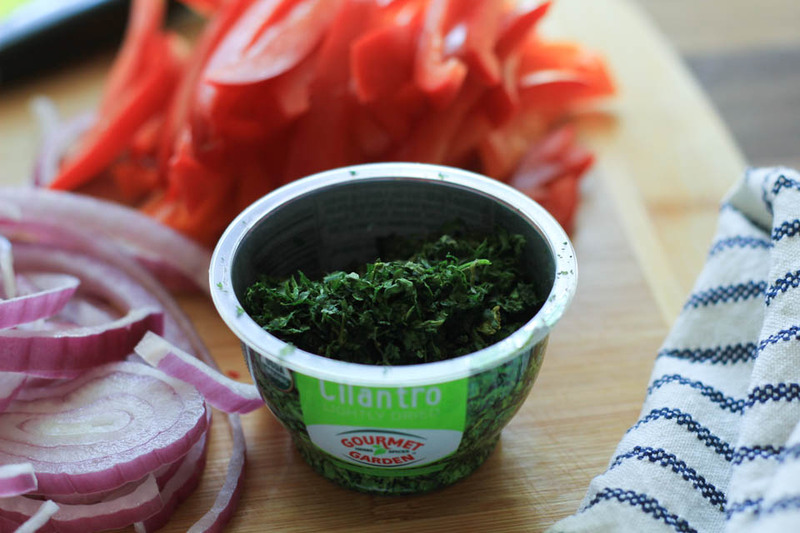 Ancho chile combined with cilantro, that’s how! I am super happy with how these came out, they are deeply flavored simply by sitting in the marinade for a little less than hour, which helps a lot. And I used chicken breast to soak up the marinade quickly. I won’t lie, we still go there because we love all of the waiters and food! But when I want a super quick, I mean cooks in fifteen minutes quick, and healthy homemade meal, I make these. *Cooking note: You can easily make this recipe outside on the grill to enjoy the outdoors. And if you have a grill pan, use it! Just follow the exact method, but heat your grill to high on one side where the pan sits. That’s it! *Slice chicken strips against the grain, this makes for a more tender bite. Simply look for the grain, and slice the opposite way of it. 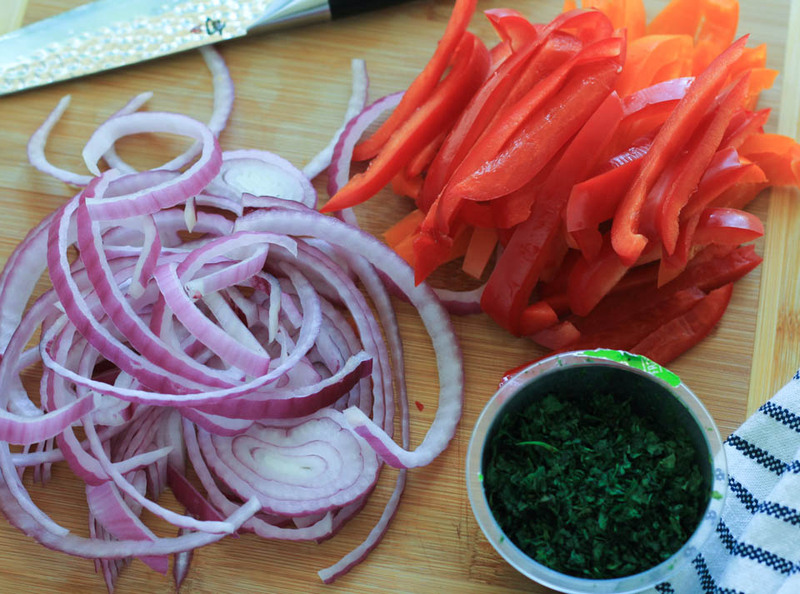 Add olive oil,cilantro, garlic, ancho, and lime juice and zest to a large bowl, whisk to combine. Add chicken and coat with mixture using hands or tongs. Sprinkle chicken with salt and pepper to coat evenly. 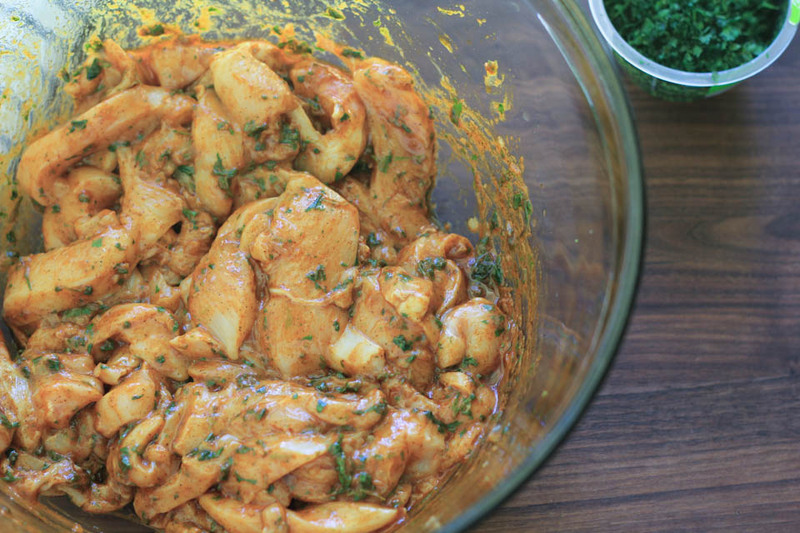 Marinate in fridge for 45 minutes. Remove chicken from fridge and allow to sit on counter for 15 minutes. Heat cast iron skillet over medium high heat with 1 tablespoon olive oil. Once oil is shimmering, add chicken, sear for 1-2 minutes, lower heat to medium and cook for 12-15 minutes or until internal temperature reaches 155 degrees. Cooking time may vary depending on how thick the chicken breast is. Add sliced bell peppers and cook, tossing several times with tongs, for about 3-4 minutes until slightly softened but still holding texture. Taste and season with salt and pepper if needed. Sprinkle with remaining 1 teaspoon cilantro to serve. 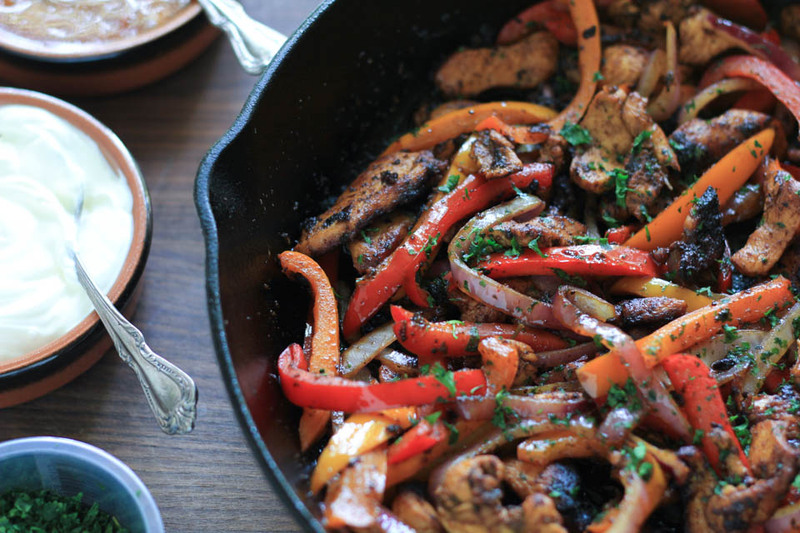 Serve in the cast iron pan immediately with warm flour and/or corn tortillas, salsa, guacamole, sour cream. I also serve mine with whole black beans and a side salad for a complete and healthy meal! Disclosure: This is compensated post in collaboration with Gourmet Garden US. As usual all opinions are my own. Thank you for supporting the brands that support NJB! Other awesome recipes GREAT FOR SUMMER from Gourmet Garden! 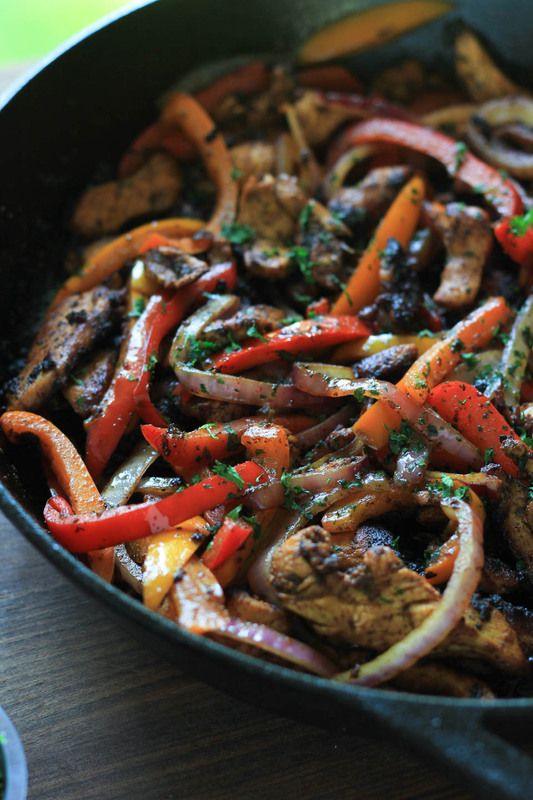 I love, love, love fajitas! And I am obsessed with how convenient Gourmet Garden products are. These look so tasty! Fabiola,the recipe looks great! Are you also willing to share the name of the Vancouver WA Mexican restaurant you found that pleased your palate? Thank you so much! Of course,I love them! It’s Lindo Mexico on Mill Plain and 123rd.